Time plays tricks with my mind. I awake in the morning thinking of the hours ahead and the way I'll fill them. In the morning there's always enough time to do the musts and plenty of the wants. In the morning the day stretches ahead with luxurious possibility. 1. The first sprouts of radishes (above) and kale. These are the first sown-in-the-ground seeds of the year. Newly sprouted, glistening with water (we've had rain). Time to plant carrots, Swiss chard, and more. 2. Moments from last weekend's party to celebrate my father's 80th birthday pop up in my mind. Here my beautiful mother holds her newest great-grandchild. Do you like mulling over events such as this, remembering snippets of this and that? 3. A few weeks ago I visited Butchart Gardens with a friend. The indoor display had a number of orchids. This green one caught my eye as it reminded me of the first flower Tim ever gave me - a green orchid corsage for a college banquet. 4. The Little Misses just after their quick Easter Egg hunt in the back yard. We were all tired after the party on the mainland and the return trip via ferry, but this Nana still wanted to do a little hunt. Taking photos of these two is getting harder and harder. They rarely sit still. Little Miss S noticed the forsythia blooms and called them "Dandy-flowers." Earlier in the week Little Miss A told me, as I left her house, "Nana, try to be good." Do you think she's heard that phrase elsewhere? These little ones make me laugh so often. 5. Apple blossoms. Our very own. Most of them are fully open, but I captured these so pink and full of promise. Will there be apples? We hope so. Last year we pulled off all the blooms and fruit starts other than one apple per tree. Then we picked them before they had time to sweeten. Patience. Sigh. Today will be full. A little trip away tomorrow and company coming on Sunday, plus teaching this afternoon all mean I have a number of things to do this morning. So I'll get to it all and hope that your day is full, but not too full to take time for a little enjoyment. Busy times.....but I hope you are 'trying to be good'! Oh we enjoyed your posting. Lovely photos. Your mom and the Little Misses are beautiful. And I like the bits of musing you've put between to get us musing ourselves. Wishing you a beautiful day...I'll be trying to be good too! I just love the pink on apple blossoms, just beautiful. baby, so sweet. 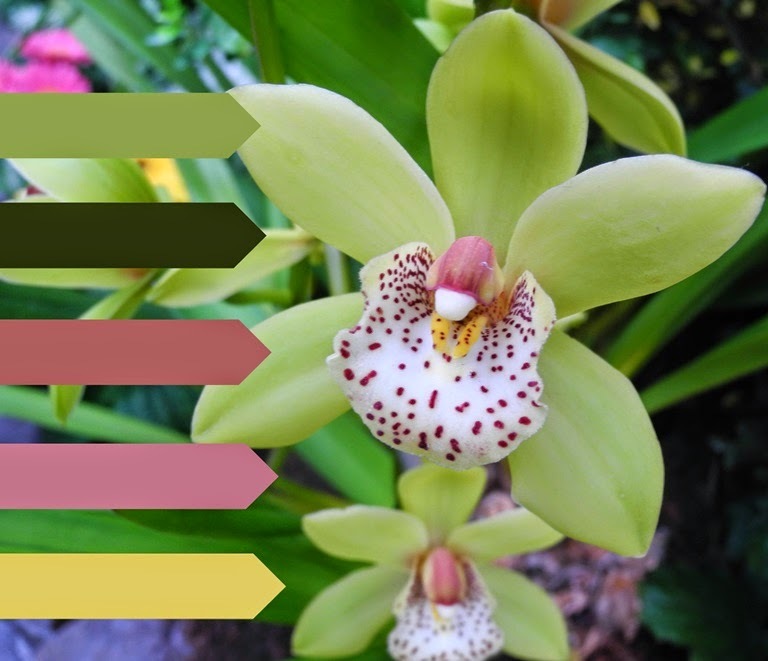 A trip to Butchart, oh would I love visiting the orchids. One of these day I must return there. Happy weekend, dear friend! I so often feel like you at the end of the day. I try to remind myself that a day of doing nothing would be fine but that would be hard for me! Your grandies are so cute. Don't you love the things they say? I should record them, like I often did not do with our own kids. I can relate. I'm indulging in that feeling of boundless possibility just now but it's time to get moving. I love that radish picture. What a lovely photo of your mother holding her great granddaughter. You had many special moments this week, even with the promising apple blossoms. I'm having a quiet day as I had a bad night and wasn't feeling well, albeit, the roofers are here hammering etc. re-shingling the back half of our roof and they aren't quiet! Enjoy your weekend. Love the photo of your mom and baby and those little girls are adorable!! Delights...indeed! How is it that your 'little misses' are so grown up already? Great post and "weekly roundup" Lorrie! Your mom is very lovely! Those orchids are gorgeous and so very exotic looking. I've wanted to go to Butchart Gardens for many years now. I've seen lots of pictures, and it just looks amazing. My in-laws visited there a few years ago. Your grands are darling, Lorrie. :-D I bet they do make you laugh often. You captured a good close-up of the apple blossoms. We had an older apple tree in our yard when we bought this house, but a bad storm in 1999 destroyed it. We really should plant another one. I enjoyed your post and I hope you have a nice weekend! You must get up early, Lorrie to accomplish so much by morning. What a delight to see the generations of family in you photos. Happy Birthday wishes to you dad. Cheeky pinches to your little Missies. Calling a boat Paris has a certain appeal...... it would be fun to tell people you're off to Paris for the day! A lovely assortment of topics today, Lorrie. Your first photo of that little sprout is so nice. So many new and exciting things happening in the garden at this time of year. The photo of your mom and her great-grandchild is just so precious. What a special moment! Love the photo of your little grand girlies too. They are adorable. Those apple blossoms are so lovely- hope you have more apples this year- we had ONE cherry last year- but it tasted fantastic- here's to more fruit this year! How delightful those little Misses are! So cute. You are blessed Lorrie! I love the Apple Blossom! What a great blessing for your mom - so special that you can all be together and have moments like this preserved in photos -- your excellent photos! That green orchid is captivating!! Oh a lovely post - such grand and fine things - sometimes big and sometimes small - but all wonderful.. That's a wonderful photos of your mom and the newest baby - what a special time. Great photos!!! Awww, those little misses are darling...and growing right up! I love the picture of your mom, too. She looks so happy to be getting acquainted with her great-grandbaby. I see some of you in your mother's face. Family resemblance is a fascinating thing. What a great capture, the water on the radish sprouts! Lovely pictures, Lorrie! How cute your little grandchildren are.....mine make me laugh so much too, the funny things they say! A lovely picture of your mum and the sweet baby ! Oh Lorrie, I have not kept up with your blog this past week, and I've gone back and read the posts I've missed. You've been busy! Hello Lorrie! It looks like you are doing well and enjoying the season! Beautiful photos, Lorrie! You've captured love, beauty and the passing of time, I think, between the images of the generations, and the new harvest of sweet apples that will grow from such pretty flowers. Gosh your Dad is younger than my husband. You do look like your Mum. How Blessed to have great grandchildren.